It’s spring and calving season is in full swing. 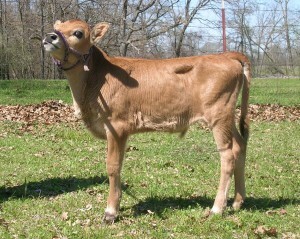 Like all breeding farms, Mini Miracles Farm has had some new miniature Jersey arrivals. However, despite the weaknesses inherent in winter forage some of our cows are just too fat for easy calving, and with spring grasses coming on strong the problem will only get worse if we don’t act now. You may ask: How fat is too fat, and how can being fat affect calving? Let’s take a case in point – admittedly it is a bit unusual. At the end of February one of our cows suddenly went into what appeared to be labor 3 days before her due date. After many hours of contractions and no baby in sight, we rushed her to the vet only to be told that she wasn’t in labor after all, but that her calf was out of position and upside down and was apparently trying to turn over causing the cow pain and discomfort. The physical examination indicated that the cow’s rumen was pressing on the calf so much that he could not move into position. Our vet’s advice was to get the rumen size down ASAP! In response to our vet’s suggestion, we put our cow into a large birthing stall, fed her small amounts of grain to maintain body condition and drastically reduced her consumption of hay and other roughages. By the due date, our cow’s rumen was half the size it had been and the calf was born without complication. It seems we learn something new every time a calf is born, but as a result of this experience we are taking a critical look at our herd as they near calving. The issue in the case above was not general body fat, however it can be a problem in some cases, but the rumen size. 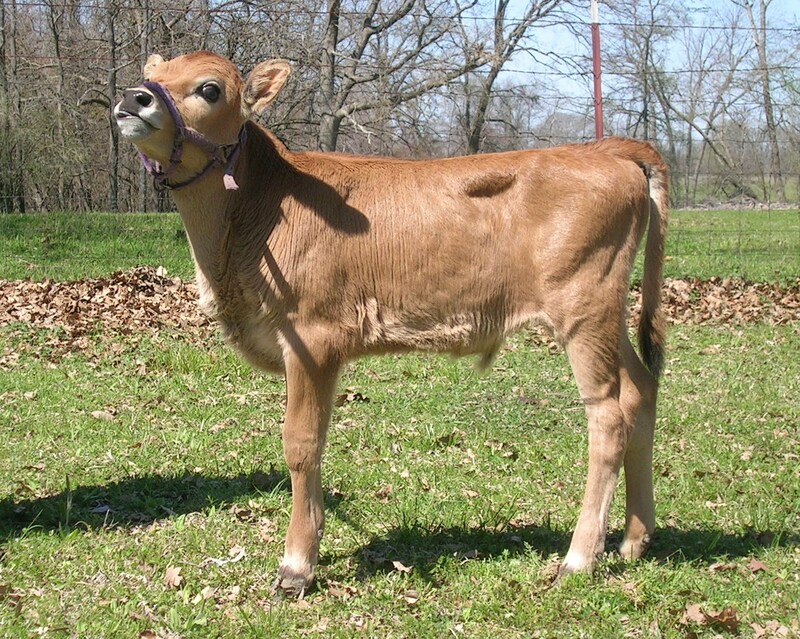 Many times you see mini Jersey cattle that appear pear shaped when looking at them from the front. If we see that the rumen sticks out further than the ribcage of the cow, we move her to a well-grazed pasture, add grain to her diet and reduce hay and grass until her rumen size is down where we want it to be. If this doesn’t work we move her to a paddock where we can control her entire diet and feed her hay only sparingly. Already we have seen remarkable physical changes in the cattle we’ve targeted and expect to experience even easier calving as a result. Miniature Jerseys as well as standard Jerseys are known for their ease of calving, but the more we can help the cow in this most critical time, the healthier she will be and the longer she can produce quality calves.